NEWS FLASH: there’s a really interesting Mockingbird thread going on right now, started by Jeff Dean and Dave Browder, on a proposed tax on sugar sweetened drinks like Coke. It’s already quite long — take a look! Putting individual solutions and free will up against the increase in portion sizes, massive technological and societal changes, food-company taste-engineering, and the ubiquity of effective television advertisements is like asking Ecuador to conquer China…. This jumble of circumstances and effects is what Thomas Frieden means when he says that just being an American can naturally lead you to be obese: obesity is an almost inevitable consequence of living with our cultural norms, our history of agricultural production and subsidies, our long-standing socioeconomic inequalities, and the impact of technology on our behavior and bodies. 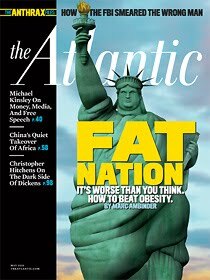 Against this formidable dynamic, America has erected two lines of defense: name-calling, and hectoring about diet and exercise. For the average fat person, life can be an endless chain of humiliating experiences. On a flight to Denver not too long ago, I watched as a very large woman struggled to settle into her seat. Next to her, a much skinnier man curled his lip in disgust. The woman softly asked a passing flight attendant for a seat-belt extender. The flight attendant didn’t hear her over the roar of the engines, so the woman had to ask again, and this time, everyone looked at her. Grocery shopping, eating at restaurants, going to the movies, having drinks at a crowded bar—for the fat person, these are situations to be negotiated and survived, not enjoyed. The workplace is no different: a television executive once remarked to me that my career as a political analyst would “really take off if [I] would just lose a few pounds.” When I was fat, I avoided meeting people’s eyes. I didn’t want to subject them to my ugliness. PS. This isn’t the first time that this subject has come up at Mockingbird! Click here (and scroll down) to see a lot more. I'll share my big guy story. I can't ride old wooden roller coasters at amusement parks because I can't fit in the old seats. So this is definitely a significant issue that matters to me. It's funny because I'm a product of an educational system that tried teaching me from an early age how to be healthy. I guess that makes me an example of a very mockingbird truth: knowledge of the healthy living [the law] does not produce within me the desire to live healthily [obey the law]. In fact, it makes me want to do just the opposite. Hey Bryan. Nice to hear your own story… and touching. Thanks. PS. Always nice reading stuff you post here. Very thoughtful. And you're a good writer.